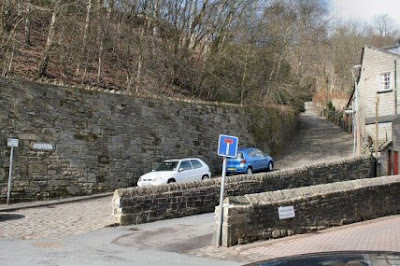 From St Georges Square the walk up to Heptonstall starts once the Packhorse Bridge is crossed. 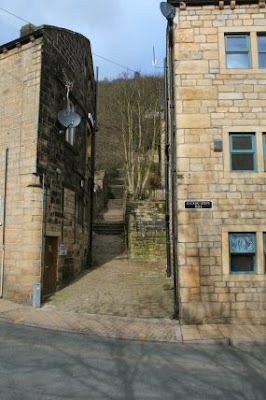 Next to the Hole in the Wall pub is the cobbled lane that is the footpath. I don't know what the angle of the road is but it is steep. This pathway is called the Buttresses. Cardiac Arrest more like! One hundred yards in and it gets even steeped. Feet before the top is reached is a small cemetery. Have a look around as its a great excuse for a rest. They don't waste land here with bits on the flat being at a premium so it is well crowded. A little way down the road and its back onto a footpath. The path is still going upwards. You rise up about 500 feet is short time but this time there are stairs as well. Then on to the end of the path and a seat which is well used if I am anything to go by. 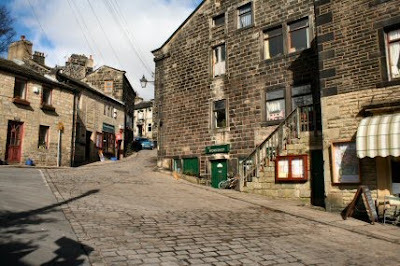 Another road and the cobbled streets of Heptonstall are there. This place is definitely not made for cars. As you can see the one coming down the road is almost touching the pavement on both sides. I turned left here and headed for the church. 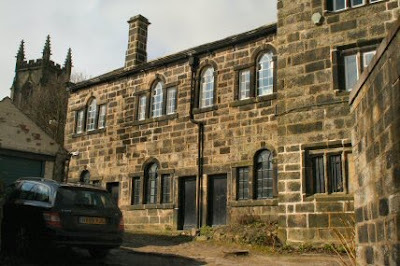 Old houses abound and the new builds will soon mellow and fit in. 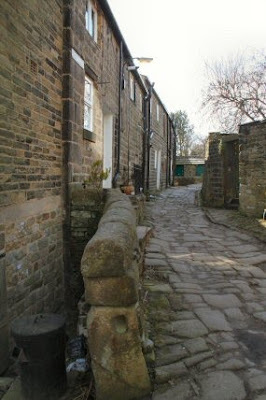 All over the area are quaint lanes complete with cobbles and looking like Charles Dickens is just around the corner. 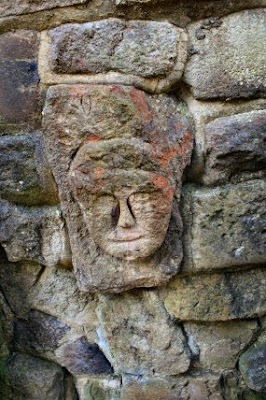 For some reason this old lane has a carved head stuck in the wall. I wonder where that came from. Looks a bit naive to be from the old church. 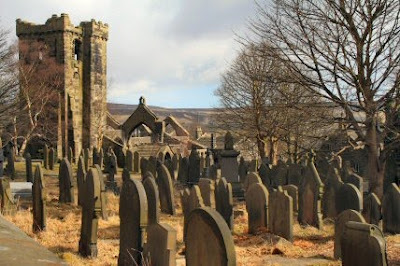 The old 15th century church was burnt down in Victorian times and is amidst a sea of grave stones. In places the stones have been laid flat and it feels quite weird as it is as though the churchyard has been paved over they are that close together. I did notice many from the 18th century and one or two from the 17th. I must admit I do find it sad that something could last as long as they have and then get worn away by visitors boots. In the new church is a copy of one of the 'coiners' burials. The book says that the grave of the infamous coiner David Hartley is around somewhere. 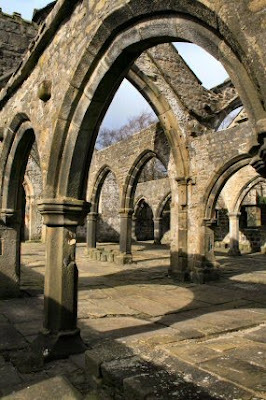 The remains of the old church are quite stunning. The place seems to be made up of arches and in its day must have been quite something. Leaving the church behind and following another footpath through the new developments you come to the edge of the world :-) This is known as Hell Hole Rocks. The footpath is only a couple of muddy feet wide and then there is the drop straight down to the valley below. 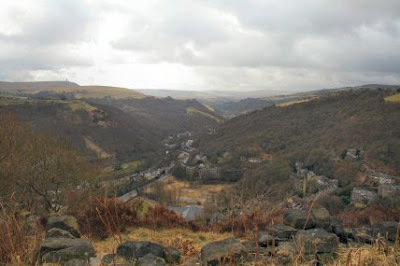 This is the view up the valley towards Todmorden with the road, rail, river and canal sharing the flat bottom of the valley. The pimple on the hills to the left is Stoodley Pike. This is a walk for during the week and is the longest by far and climbs 1000 feet from the valley bottom. 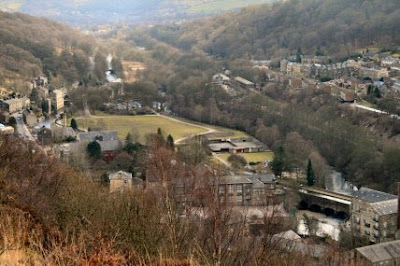 Walking right around the plateau the view changes to that of Hebden Bridge. From this point you can see the aqueduct that is hardly visible when you walk the canal and the railway station just above the playing field. The descent is nearly as hard as the climb up. 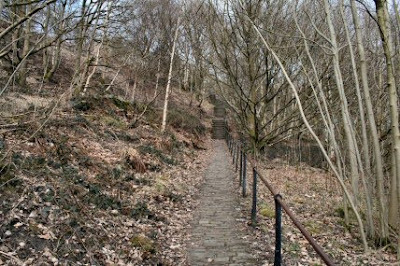 Most of the time it is through a woodland and past a disused quarry. Wherever you look there are rocks about waiting for a good clout from my rock hammer. Its a bit of a surprise when at last you come down from the hills to another set of stairs. 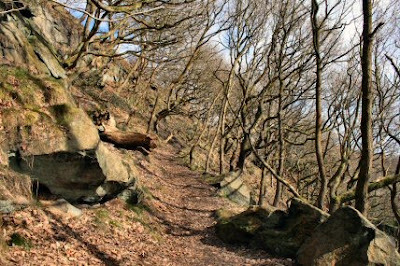 These are known as the Cuckoo Steps. I think you must be cuckoo to make a habit of climbing them. Across the road is the Co-op and a minutes walk back to the boat.